Are you looking for a waterfront office in the heart of a bustling marina site? If you are, or know someone that is, then we have the perfect office for you. The office is on the 1st floor, is brand new, and consists of a main office/showroom, store room and brand new fitted kitchen. Have meetings with your customers out in the sunshine and take in the beautiful views across the harbour. This really is a lovely place to come to work. 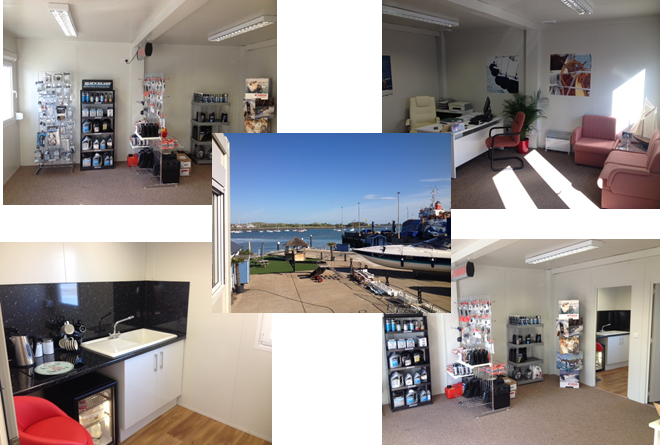 The office would be perfect for a 1-4 person marine business with harbour views and easy access to the water. With free on-site parking and a raft of other great reasons to come and join us here, give me a call to book in your viewing today. Photos shown are of Kings Marine who occupy one of the offices. The office for rent is completely empty of furniture and racking, however, the flooring, walls and kitchen are the same as Kings Marine. Calling all 7m to 10m boats.